A new Star Wars for a new generation. Plenty here to please old fans and new. 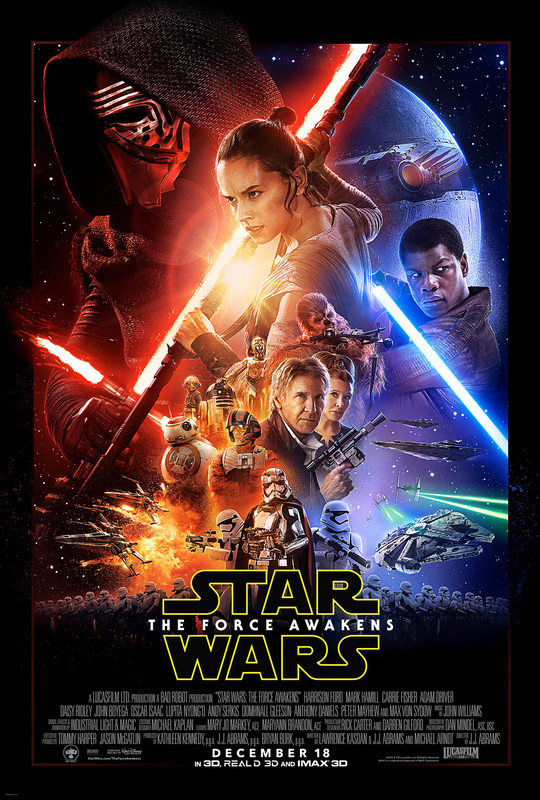 Finally an SF franchise that JJ Abrams’ sensibilities mesh with instead of clash. No Jar Jar or midi-chlorians. Better than the prequels. With Star Wars: The Force Awakens JJ Abrams had a nearly impossible task, he had to please old fans and acquire new ones, pay homage to the old films, undo the errors of the prequels, and yet also create a new Star Wars for the new generation. The film had to appeal to children and adults alike and therefore had to indulge the older fan’s nostalgia but not let it dominate the storytelling, have enough action and visual effects to entertain today’s jaded youth but refrain from the frenetic screen clutter that plagued the prequels making the actions sequences migraine inducing blurs of sound and light, and, above all else, launch a new mythic storyline. Given that this was not just a film but also part of a multi-billion dollar media franchise and of one of the most beloved film franchises of the modern age, to say expectations were high is perhaps a bit of an understatement. So because anticipation was so great, because expectations were so ridiculously high, it should come as little surprise when I say that The Force Awakens is a mixed bag. It isn’t terrible, and it isn’t amazing. It had its high points and it had its weak moments. There were some great lines and some misses. In Abrams’ defence, no matter what he produced it was not going to be able to please all the fans all the time, so I am actually surprised at how much I enjoyed this. If we are measuring it solely against the prequels then in this regard Abrams cleared it with a parsec to spare. Against the original Star Wars: A New Hope… that is a more complex comparison. There is a new villain, a dark militaristic force in the galaxy the First Order, led by a slimmer and slightly more sartorially elegant Darth Vader wannabe, Kylo Ren (Adam Driver). There are two new young heroes, Rey (Daisy Ridley) and Finn (John Boyega), who, despite their disparate backgrounds will undoubtedly turn out to be instrumental in saving the galaxy. There is a new cutesy droid, BB-8, that is attempting to take the place of R2-D2 in our hearts, and comes close to doing so. Adorkable is the word that springs to mind. And there are X-wings, Tie Fighters and all the classic elements of Star Wars galore. So rather than attempting to re-invent the wheel as the prequels did, Abrams went with tried and tested crowd pleasers. So let’s start by discussing a couple of the really good points without getting into too many specifics as I don’t want to spoil the film for anyone. The opening wall crawl. There is something about the logo appearing and the wall crawl against the starry background while John Williams’ overture assaults the brain that will forever be ‘cool’ in my book. When the music started I couldn’t help it but grin and feel excited. What was even better was that there was no mention of a trade embargo, sanctions, disrupted negotiations or a diplomatic deadlock in a bureaucratic senate in the scrolling text. It then pans down in classic fashion to a shot of a giant spaceship. I hope no one regards that as a spoiler, not least because it is a bland and generic version of the events, but also it is the classic opening and it occurs in the first couple of seconds of screen time. Not a single, horrendously racist caricature to be seen in the first minute. So already it is well ahead of The Phantom Menance. It was also great having new characters to carry on the story. Star Wars: The Next Generation, if you will. As much as I loved the story of Luke, Han and Leia… and was less enamoured with the prequels going back in time to set up the story of Luke, Han and Leia, it was genuinely nice to have new characters, about whom I knew next to nothing, who promised to lead the story into new territory. Daisy Ridley’s Rey is a nice change of pace for the Star Wars cinematic universe in that we finally have a competent, intelligent, talented, and independent female character who is centre screen as a hero and not a spunky support or love interest to the main heroes. Strongly reminiscent of the young Luke Skywalker (they clearly shop in the same desert paraphernalia shop) it seems that Rey is going to be central to the entire new trilogy. Rather unkindly my brain automatically labelled her as Discount Keira Knightley and I haven’t been able to shake the comparison. John Boyega’s Finn is a surprisingly complex character who wants to be a hero, wants to do the right thing, but is plagued by crippling self-doubt and more than a smidgeon of self-loathing. A curious mix for a hero in training, especially as he veers from the super-competent to the blaringly incompetent in a violent see-saw fashion as the script demands, but it is certainly engaging to watch. Both Rey and Finn promise to develop even more fully as the series continues, and that is only a good thing as they have an odd dynamic on screen, and it will be nice to see them settle into their roles and see what they can create. Opposite them is Adam Driver’s Kylo Ren, who, at first glance, appears to be a bargain basement Emo Vader. Face mask, metallic voice, red light saber, dresses in black, temper tantrums because it is just so emotional, and will force choke you as soon as look at you. However, he soon becomes a great deal more interesting and, as his backstory and motivations are explored, his character develops a depth and complexity that Vader never quite achieved in the original trilogy. Admittedly, he is not quite as dominating on screen as Vader, nor does he have the gravitas of James Earl Jones’ voice, but in a number of regards he is a lot more chilling and arresting on screen. Thankfully, unlike Tom Hardy’s Bane and Christian Bale’s Batman in The Dark Knight Rises you can actually understand what Driver is saying even when his face is obscured, something I was actually concerned about. There are a couple of other characters, more in supporting roles this time around, that I sincerely hope get more screen time in the next one. Not least the roguish Poe Dameron (Oscar Isaac) who is the best damned space pilot around (as we are told on numerous occasions… so it must be true), the scenery-chewing, mewling evil General Hux (Domhnall Gleeson), arch villain and champion of the galaxy sneering competition 7 years running Andy Serkis’ Supreme Leader Snoke, and the decidedly under-utilised Captain Phasma, Gwendloine Christie’s retro-futuristic chrome trooper. Despite my desire that they all get more screen time, none of the characters feels entirely superfluous and each adds to the story in significant ways. In terms of action, Abrams seems to have learned both from the mistakes of the prequels and from his experience on the Star Trek films, and provided something that had satisfying explosions, lots of lasers pew-pewing, and some good light saber action without the need for a warning about photosensitive epilepsy or necessitating chugging Dramamine in large quantities. Hearing the metallic whine of the distinctive TIE fighter engines with their unmistakable laser blasts, and the roar of the X-Wings’ engines coupled with the more splat-like noise of their weapons was a glee inducing moment for me. The screen never felt empty during the action, but was never so busy that you couldn’t actually track the action. It was also thankfully free of omnipresent lens-flares. As is to be expected of Abrams, there are some beautiful looking cinematic shots, some really vivid tableaux, and he uses many of these to establish the ‘lived-in’ feel of the Star Wars universe. That distressed look that makes the ships look used rather than fresh off the assembly line, the clothes worn and frayed, the equipment chipped and nicked. Little details like this throughout the film give a real sense of authenticity and greatly add to the believability and immersiveness of the story. This becomes all the more necessary when the staggering coincidences start to mount up. I mean, I am all for a million to one shot working nine times out of ten, but there are some really astronomically improbable coincidences cropping up in this film with frightening regularity. For fans of the original trilogy, TFA is, at its heart, an attempt to re-make it and update it while pretending to be a new chapter. And that is perhaps what I found least satisfying about it, there was too much of the old in this. There were too many similarities to the original trilogy. There were too many moments that were a mirror or echo of vintage Star Wars. This is Abrams’ Trek all over again. Not quite a reboot, and not quite a sequel. Fan service and in-jokes litter the screen, and in-depth exploration of character and story are sometimes short-changed in order to move onto the next sequence, the next plot point, and the next ‘must-see’ moment. At times the nostalgia was dripping so heavily I was surprised the camera didn’t suddenly switch to a sepia filter. There were other moments that only really had impact or meaning if you were already deeply invested in the Star Wars mythos. But in this I suspect that Abrams’ hands were somewhat tied. He couldn’t not have those nods to the originals, but for my money, he spent a little too much time genuflecting at the altar of Lucas and not enough time carving his own mythic cathedral. Related to this problem was the fact that the film felt liked it was rushing from scene to scene to hurry up and get to the good part… only to rush past that to the next good part… and so on and so on. It was as if Abrams was so excited to be showing the audience all the different ‘cool’ things that he forgot we don’t need to see them all at once, or even at all. In fact, some of the moments when Abrams pauses to take a breath were scenes that were probably not that necessary. I have no idea why Hollywood has decided its audiences are so stupid that they need almost every element of backstory of every character belaboured and shoved in their faces. This is compounded further by the relentless assault of action sequence after action sequence. Consequently, we are less emotionally involved in many of the conflicts because we still haven’t gotten to know the characters or feel tension as they just seem to ricochet from one meaningless action set piece to the next. Admittedly, superhero films tend to be a lot worse. To be any more specific than this would be to dance merrily through spoiler territory, an area that I am already uncomfortably close to, so I will have to forgo discussing the most egregious scenes. However, all in all it was a good film. It was an entertaining film. It sets up the next film to develop the mythos and storylines further. There are some revelations that make for moments of high drama, as well as some unanswered questions and plot hooks that will have me seeing the next one as soon as it comes out too. Who am I kidding, I am probably going to see this one again at least another four times before the next is released. This entry was posted in Review and tagged Film, JJ Abrams, Review, Spoiler Free, Star Wars, The Force Awakens. Bookmark the permalink.